It’s not necessary to climb a mountain to reach the stars, but sometimes you have to dress like it. During the great January freeze of 2018, when the polar vortex decided to dispatch its nose-hair-freezing temperatures south, Jeff Haidet spent his evenings in the Grande Pines Observatory with the roof open, staring into deep space and a case of frostbite at the same time. Maybe not frostbite. His base camp, well, house is less than a hundred yards away. Nonetheless, here is a man who makes hay when then the sun doesn’t shine. Or the moon. “Everyone he knows, knows he hates the moon,” says Jeff’s wife, Vicki. If your intention is to draw a bead on the Running Man nebula in the constellation Orion, the glow of the moon is nothing more romantic than a bad case of light pollution. The Grande Pines Observatory is as likely to be mistaken for the Gemini Telescope as Jackson Springs is for the top of Mauna Kea, but it’s surprising what can be seen if you know where to look. Most people have a shed for gardening tools. The Haidets have one for citizen science. The official observatory code of the 10-by-12-foot building is W46, the number associated with the data Haidet voluntarily supplies to the Minor Planet Center, part of the Smithsonian Astrophysical Observatory, and to the Lunar and Planetary Laboratory at the University of Arizona. One is the worldwide clearinghouse for all things asteroid, the other is Near Earth Objects. Wow! Before we moved here, we heard about the Dogwood Trees in the spring. We totally under-estimated the beauty and the number of trees. They are spectacular -- and they are everywhere. 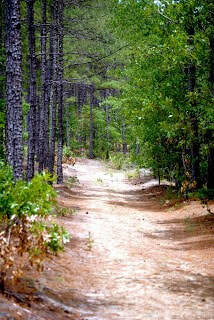 Among the pine trees in Grande Pines, along the side of every country road, in all of the parks, lining village roads. Pink, red and white. The view on the left is of the railway line that runs through the middle of the Village of Southern Pines. Back in 2007, my wife Adele and I decided that we wanted to move from California. At the time we lived in LaCresta, an equestrian community on the Santa Rosa Plateau near Murrieta and the Temecula valley. We had built our LaCresta home only 3 years earlier and were enjoying our retirement. Why the decision to move on? Since moving our family from South Africa in 1986, we had lived in Potomac, MD, Southern California (Irvine), Houston (twice), the Netherlands and then back to Southern California, where we found ourselves having this discussion about relocating. We decided that we wanted to live in a rural community, away from the constant traffic of Southern California. We were also looking for a "village-like" feel, easy access to horse trails with traffic-free riding and finally, to be on the tee in no more than 5 minutes. Tough order? Well, we found all of the above - and more, in the Pinehurst area of North Carolina. Pinehurst has given us everything we asked for. We built our house on 11 acres in Grande Pines, a development in Foxfire Village. The Foxfire Golf Club is next door and we are only 7 miles from Pinehurst Village. 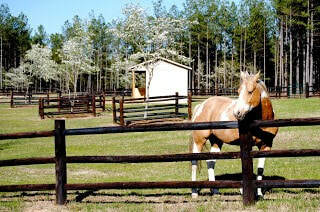 Grande Pines is an equestrian community with miles and miles of great trails. Our three horses have settled in and love being in the wide open pastures. Our three dogs disappear as they go exploring in the forest, always returning -- exhausted, but clearly exhilarated. Golf at Foxfire is on two Gene Hamm designed courses, both in great condition. If you want golf diversification, there are another 40 courses in the area! Truly the golf capital of the US. Visit the Grande Pines website (www.grandepinesnc.com) -- I think you'll be impressed! Visit for a few days and the sincere friendliness of the people will impress you even more. ​Grande Pines is horse heaven. Only 7 miles from Pinehurst, Grande Pines is located in an area commonly known as the Sandhills. This strip of ancient beach dunes is the evidence of a former coastline when the ocean level was higher, or the land lower. Amazingly, it is claimed that the beach deposits were formed principally during the Miocene Epoch, circa 20 million years before the present. The result is that Grande Pines is basically a pine forest on a beach! The footing for the horses is excellent, making long trail rides a real pleasure. The Grande Pines trails wind through 750 acres of peaceful rolling hills. Pete Mace's vision in establishing 15 foot easements throughout the development will ensure that the trails will always be there. Every lot of 8 acres or more has a trail along at least one side, making for easy access. Our property is a good example. We have 11 acres and trails on three sides of the lot. Saddle up at the barn and ride straight onto a trail! No traffic, no streets to cross, just miles of quiet, peaceful riding with the dogs following. This weekend we are kicking off a project to name the trails and signpost them. A great opportunity for the residents to get together and to name the trails that run by their properties. In these photographs are our horses Apollo, a 20 year-old Arabian Thoroughbred, Lola a 8 year-old Tabiano Paint and Guinness, their faithful pony companion (and troublemaker!). We are hoping that Lola is pregnant after spending a few days earlier this month with a very handsome Palomino sire. ​Clearly, the availability of excellent health care is a key decision factor when considering relocation. This was no different when we first considered the Pinehurst area as a possible new home for the two of us and Del's mother, who lives with us. We read and heard a lot about the FirstHealth Moore Regional Hospital and its status as one of the leading hospitals in the state. When we first visited the area, we drove through what has become a sprawling campus of Moore Regional facilities and specialty clinics like Pinehurst Medical Clinic, Pinehurst Surgical and Pinehurst Cardiology. The care that is received here and the technology and resources made available to patients is unmatched anywhere in North Carolina, and in many cases the country. - Del's mother has failing eyesight and had previously undergone lens replacements in both eyes. Just before leaving California the lens in one eye slipped, leaving her with double and blurred vision. Specialists in California advised us that while repair was possible, it was a dangerous procedure because of her advanced glaucoma. After reading about Carolina Eye Associates, we decided to wait until we had relocated. The specialists at the clinic confidently took on this delicate procedure and completely restored her vision to where it was prior to the slippage. The quality of the care at the eye clinic was so good that it surprised us. - While working with the horses at the barn, Del experienced a sudden and rapid increase in her heart rate. Medics from the local FoxFire fire station rushed her to Moore Regional. During the ambulance ride her heart rate at one time exceeded 200 beats per minute. I followed and witnessed first-hand the emergency personnel in full action. Fortunately, the diagnosis was positive and she was at home the same day with no ongoing problems to be concerned with. The professionalism and thoroughness of the emergency room staff was simply amazing. Hopefully we won't be back any time soon, but it is comforting to know that this type of treatment is just down the road. - A few weeks ago I was diagnosed with a full tear of the rotator cuff in my right shoulder. Last week I had surgery to repair it at Pinehurst Surgical, a multi-specialty clinic comprised of eight specialty centers located in a state-of-the art facility. Dr. Ward Oakley did the surgery. I have unfortunately experienced other major surgeries at highly rated facilities in Southern California and in Houston, TX. I am happy to report that Pinehurst Surgical, in little Pinehurst NC, is more than comparable to anything that I have experienced. Throughout all of the treatment and pre-op prep work, I felt as if I was the only person being treated that day -- and the clinic was really busy! I left with the feeling that every person that worked with me truly cared about my well being. It is perhaps unfortunate that we had to deal with all of this in our first few months of living in the Pinehurst area, but it sure makes us feel even better about our decision to make Grande Pinesour home! The doctors, nurses and administrators across all of the facilities and practices in the Pinehurst area are all very special people. It is a blessing that a relatively small population can have immediate and easy access to world-class care. ​Many equestrian communities are challenged with maintaining a trail system and are often dependent on the cooperation of property owners due to easement issues. The result is either having to trailer horses to a central area in order to gain access to the trails, or crossing busy roads and intersections. Not so at Grande Pines! 15 Foot easements throughout the 750 acres ensures that the trails will always be there. All lots of 8 acres or more have a trail along at least one side of the property. Our lot is 11 acres and we have trails along three sides! Ride off the property straight onto a trail. No roads nor traffic to deal with. At Grande Pines trail riding or walking is easy and safe. The trails are all cleared, but are intended to blend into the landscape. An adopt-a-trail program is in place and property owners were given the opportunity to name the trails. A trail map with the names is now available and will soon be posted at one of the trail heads along Grande Pines Vista, the main street through the community. We love the trails. Early morning or late afternoon walks or rides are so relaxing. Always a great way to either start the day or wind down! Open Gates at grande pines! ​Big weekend at Grande Pines as we open our gates to potential new land owners and home builders in our beautiful, somewhat hidden gem. In the new Buytenhuys household on Grande Pines Vista, we are all settled in and loving it! Especially the early morning walks with the dogs -- new smells and sounds really get them excited - and riding the trails on Apollo and Lola. Peaceful, serene and just a great lifestyle. 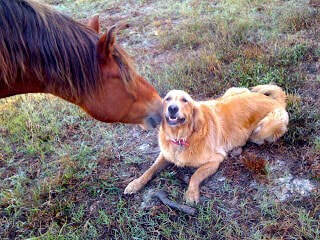 We love it, the dogs and horses are in heaven. Today we stocked the local pond with 1,000 fish. Now, when the grandkids visit they will be able to enjoy their first fishing experiences. They are already talking about it. For me, I'm waiting for the catfish to reach eating size! We have also started naming the trails in Grande Pines. Each resident and landowner has adopted one or more trails and the signs have started going up. The trails are in great condition and take you to every corner of the property -- all 750 acres. If you are in the area, I encourage you to come and take a look. Everyone who visits is amazed that a community such as this is only 7 miles from Pinehurst. Come on over! It's Open Gate Day At grande pines! It's Open Gate Day at Grande Pines ~Residential Community~ Sunday, October 1st from 1pm-5pm. Come take a Sunday Ride through and see what is behind the "GATES OF GRANDE PINES". 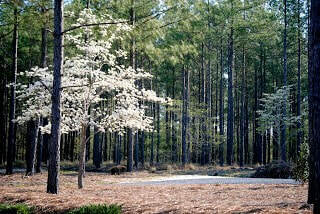 Check out some of the most beautiful LOTS & ACREAGE IN MOORE COUNTY. GRANDE PINES has a big announcement to tell! So stop by and look for THE BIG TENT! LOT/ACREAGE & SURVEYS with FALL Pricing.